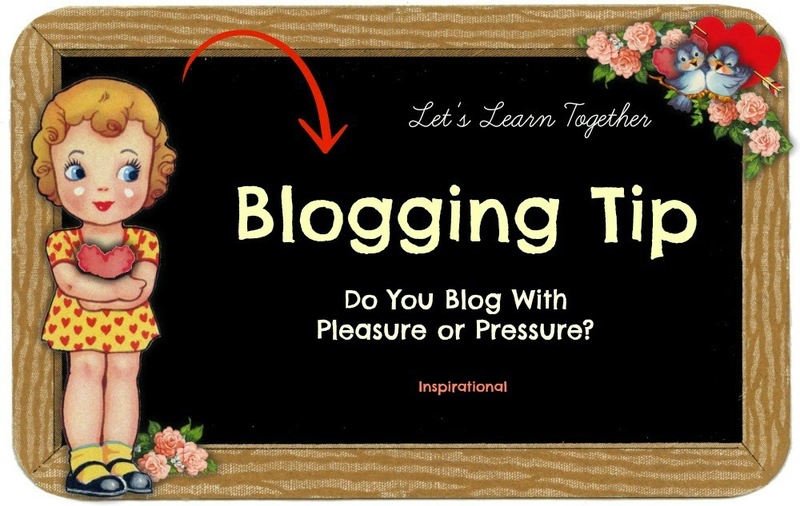 Brenda @ It's A Beautiful Life: Blogging With Pleasure or Pressure? What if we likened our posts to the old letters in the bygone days that came from loved ones, often few and far between, but all the more dearly looked forward for all their rareness and beauty? I've noticed for myself over the years, and I see the symptoms elsewhere... people enthusiastic about blogging lose momentum and with that comes the sighs and regrets of closing down precious sites. There are duties of life, work, family issues and these must have our time and energy. Of course we understand that's needful. There are the pressures from other bloggers, maybe those who have turned more professional (go for it, I'm happy for that too) but now those of us who have taken to blogging as a form of expression, for our own creative pleasure or as a gift to others, start to feel pressured or overwhelmed. Maybe we start feeling we have to perform more, bigger, more brilliantly to keep up or keep readers coming back. I have thought about whether I want to switch to WordPress, but I like Blogger. I have thought about whether I should make money blogging or keep it as a hobby. I don't want to make money at this. This is my way of connecting to kindred heart friends from around the world. I don't want ads 'cluttering' my beautiful blog. If I could just say... I hope you don't fade away entirely from your blog. I do know that sometimes we feel the 'need' to post regularly (but maybe that's a modern thing in our instant world and we should just get over it). So what if we post less often, a couple times a week instead of every day, or even once in a blue moon? Those who love visiting and have connected a kinship will visit however rare a post goes up. I know that for myself. I wait and when I see a new post of a blogging friend, it's like getting mail from loved ones who live in a far away places. Maybe we could write our posts the way we used to write our letters or chat on the phone with friends -- frequently or infrequently, but certainly not every day. And did our friendships wane? Probably not. Let's just want to come back to the gentleness and let go of the modern pressure to keep 'performing' or we'll lose what's most precious. I'm talking to myself here. If we enjoy the connections of a handful or a few dozen, and nurture those, recognizing that some will always follow from afar (which is perfectly fine), can we just enjoy and rest in that without fear? And if we get to the place where hundreds love visiting, we'll rejoice in that too. Insert... I think of our beloved Susan Branch. She has many, many beautiful girlfriends following her now. She gets hundreds of comments on any one post. We remind ourselves that she's been building these relationships for decades through her faithful commitment to her art, her writing, her work in the heart of the home. It's decades of loving others through her craft. I would never, ever want to be envious of that. For I love her as many others do. How many bloggers have been doing similar things? Which means I don't want to be envious of anyone else either. But to enjoy and receive the gift of what others share without worrying if mine's good enough. Insert... All that said, I would like to explore ways that you and I can increase our readership and not stay with just a handful of comments, if we want something larger. After all, if the good Lord has given us things to say -- whether they are grand ideas or our every day living stories -- then there must be a company of readers who want and maybe need what we have to say. The other hand in the clap. Please note: This post is in an unfinished state... because I haven't really finishing sorting it out. It was a post I started a long time ago and I'm not sure how it got published today, as I wasn't even working on it. But since it's here, I leave it is in an unpolished state for now. I was going to feel embarrassed, and then decided this is also 'me' in my unfinished state. So I laugh instead, and relax, and hope you will extend grace, which I know you will because your hearts are kind. Brenda, I can relate very much to this post. I, too, lament my lack of readers when I feel like I put forth good content at least once a week. A lot of my already-few readers were bloggers also who have ceased to blog or visit. I enjoy putting my posts together and finding quotes each week. I understand that we cannot connect on a personal level with thousands or even hundreds. I would love even a couple dozen regular readers, not as a competition but just to know that my words are reaching and perhaps touching them or making them laugh or smile. I thought way back when I started blogging that maybe someday it could generate a little money but alas, that falls to the popular blogs. I still use Blogger and find it quite acceptable. I experimented with WordPress but wasn't as happy with that. Thank you for posting on topic that has been close to my heart lately. I have been considering whether it makes sense to keep going. Brenda, you always leave me feeling like 'it's a beautiful life'. Thank-you. I blog for the pleasure, for sure, and hope that doesn't sound selfish:) I just can't get caught up in who is or isn't reading because then pleasure turns to pressure and that takes the joy out of it! I often pray that God will bring the reader who will be blessed to pause on my porch a bit and feel refreshed. The thing I like about blogs is that those who do visit are there of their own free will. I also have said that right now I'm in a window of time where blogging works for me. Someday that may change; of course, I'm just a small-timer so if I do stop maybe only a few will notice. Oh well. We who write know that not writing is not really an option, right? (I'm sure my reader-ship is small compared to real bloggers, but I have determined to stick to the style of poetry that is me:) and those who enjoy it are welcome to drop quietly by. Here's another example of an unfinished post being published. I wasn't even working on this today??? I wrote this a long time ago and never finished it. I was working on something else today, so is Blogger playing with my head? At this particular stage, I am very excited to continue blogging and to blog for my own heart's contentment and to share the journey with whoever wants to be a part of it. I feel a tug to be here. I decided to leave the post up as is, because perhaps we can chat about it together. Love to you Linda and Janet... and thanks for giving us a glimpse of your own hearts in this. Fun... now that's it exactly, Diane. And if we keep that in mind, I think we'll be okay. Brenda, really enjoy your blog, and did I mention that your header is beautifully vintage? Your blog really is beautiful and I enjoyed reading your thoughts on these things. I am so glad this post is on here, this very day. It's exactly what I needed, and it looks like I wasn't the only one :)! I love the look of your blog, and I will confess that ads - to me - take something of the friendly feel from a blog. I am so glad you're sharing your journey.... you help give me courage to share my own! Brenda, your post was perfect for me to read today. I often think that my rather ordinary little posts aren't interesting enough, I don't need thousands of followers, I wonder if I really have time to write when there are other things to be done. But....there is a nucleus of 'friends' amongst my followers, whom I have got to know over the years. I would not want to leave them. I don't follow all that many people and normally read mainly Christian blogs. For me, slightly tied to my house and frail husband, their blogs are like a window into the world. Thank you for sharing your thoughts.....even if you hadn't planned to today! Brenda, I want you to know your blog and friendship will NEVER be more valuable to me than it is now!! Just as Elizabethd said above... I am also 'tied to my house and frail husband'. Altho my husband is more handicapped than frail, I treasure the few respite times I have in the few blogs I follow and knitting groups/friends I have the opportunity to participate in!!! I don't always make a comment, but I follow you faithfully!! I just help start another knitting group at Legacy Retirement complex and love it! I even work with a 93yo lady there! She is delightful! And I'm still always looking for my 'sticks & string'!!!! I am overwhelmed at the comments in response to this partially-baked post that went up unbeknownst to me. Thank you for your support to me personally and this blog. You are my reason for being here. And when you tell me that my words make a difference to your day... I am so blessed. I'm so very glad you took time to share your own thoughts on this whole blogging journey. I want to say how much each of you means to me too. This year in 2015 as my life shifts from working at the local performing arts centre and getting up at 3 in the morning to not having to do that anymore...YIPPEE ... I really look forward to having more time to be here on my blog, and to come calling to your 'home' more often too. To write here where my hearts tugs me to be. Here at It's A Beautiful Life sharing the journey with you as we sight new glimpses of heaven in unexpected places. My heart is full of joy... I think of you with affection and send my love to each of you! I, too, am glad you left this post up. Blogging is a pleasure for me. Sometimes I think I have something important to say, other times, I'm merely sharing my everyday life. Your blog is always a favorite! You have the most helpful posts! This one has touched my heart because it took a long time for me to "find my blogging self". I questioned why I kept posting my thoughts, actions or personal life. Every once in awhile I'd read a comment that would push me onward. Most of the time it was YOU! This is such a lovely way to view blogging-I like it so much! I would be so sad to loose the connection and friendships that have developed along the way if any one of us were to put aside our blogging. I will definitely remember this the next time, I might feel too tired, discouraged or a lost wave length in the internet highway. I "found," you over at Dewena's and looking forward to more of your posts. Hi, i just love how you write and i can tell you enjoy the simple pleasures of life.I found it so interesting what you wrote here about blogging, very encouraging. I just love reading all of your posts and look forward to reading more.